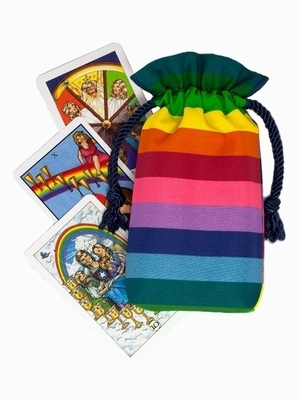 Double Draw Tarot Bags - Pride Double Draw Tarot Bag - Tarot Bags, Tarot Cards, Cloths, & More! Rainbow Symbolism: Since the 1970's the LGBT community has used the rainbow symbol to represent not just the diversity among them, but the beauty of that diversity as well. Among other things, the rainbow is a symbol of the promise of spiritual fulfillment. Size: Measures about 4-1/2" x 7-1/4" x 1" (approx. 11.4 x 18.4 x 2.5 cm). Fits most card decks that are 3-1/4" by 5-1/2" and less.